Langmuir Laboratory for Atmospheric Research, operated by New Mexico Institute of Mining and Technology, is a leading thunderstorm research facility in the U.S. and is recognized worldwide for the scientific work carried out there. The facility is named in honor of Nobel Laureate Dr. Irving Langmuir who initiated and conducted numerous experiments in cloud physics and weather modification in association with the Institute staff from 1947 until his death in 1957. The Laboratory is used extensively by scientists at the Institute, as well as by visiting investigators from other parts of the U.S. and foreign countries. Their research includes, but is not limited to, studies of the initiation and growth of cumulus convection; the relations between lightning and rainfall; the formation of hail; the location and distribution of lightning and of charges in thunderclouds; the fine structure of lightning; the effects of point discharge on cloud electrification; and the electrical budgets of thunderstorms. The facility includes cloud physics and doppler radars, tracking radars, a dense net of electric field meters, a balloon hangar for launching free and captive balloons, rocket launchers, a restricted airspace provided by the Federal Aviation Administration, video cameras reporting the cloud development over the mountain, a 200 horsepower Schewizer airplane that can be directed to fly through areas of charge within an electrified cloud, an electrically-isolated underground room at the summit of a mountain peak, and other research tools. Wireless ethernet links to the New Mexico Tech campus provide communications and data transmission. The Laboratory was established to provide a base for the study of cloud processes that produce lightning, hail, and rain. These processes are not understood and are difficult to study because they operate in large clouds that cannot be simulated in a laboratory. The Magdalena Mountains were chosen for the location of the Laboratory because thunderstorms are initiated by the mountains and the storms are often isolated, stationary, and relatively small. The weather patterns that produce frequent cumulus cloud development and thunderstorms over the Laboratory during July and August each year are closely related to the physical features of its location. In the arid southwestern U.S. the intense solar heating during the summer months causes the Sonoran “heat-low” which is a semipermanent feature of the summer weather map. The “heat-low” induces a gentle monsoon of warm, moist air to flow slowly toward the northwest form the Gulf of Mexico. In the lower levels of the maritime tropical airflow, water vapor mixing ratios of about 10 grams per kilogram of dry air often occur; these are sufficient to form convective clouds with bases at altitudes of about 4 km above sea level when some of the tropical air is lifted. Solar heating on the mountains of this area causes localized updrafts each day so that convective clouds form most easily over these elevated regions. When the winds are gentle, these clouds often go through their entire life cycle–from the first condensation to full development producing lightning, rain and hail–and then dissipate over the mountains where they first formed. The suitability of these New Mexican clouds for scientific study has long been recognized: E. J. 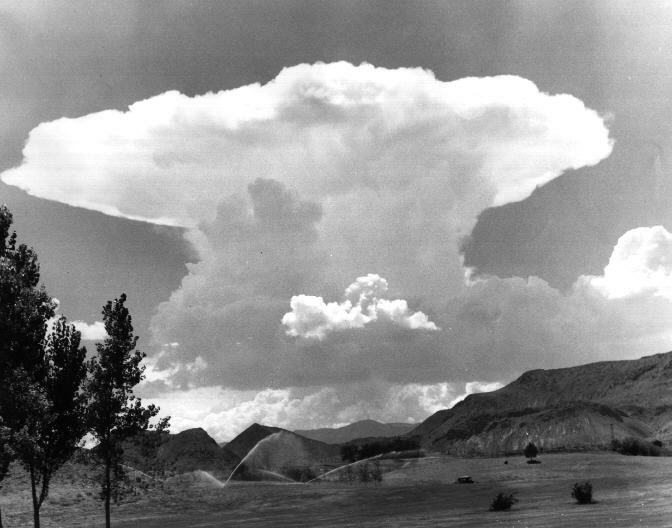 Workman and Robert Holzer began the investigation of heat-low thunderclouds in Albuquerque during the late 1930s. Their results were published in two Technical Notes, No. 850 and No. 864, as part of the National Advisory Committee for Aeronautics Report Series. After World War II, the New Mexican group moved to Socorro where Dr. Workman became Director of the Research Division and President of the New Mexico School of Mines. 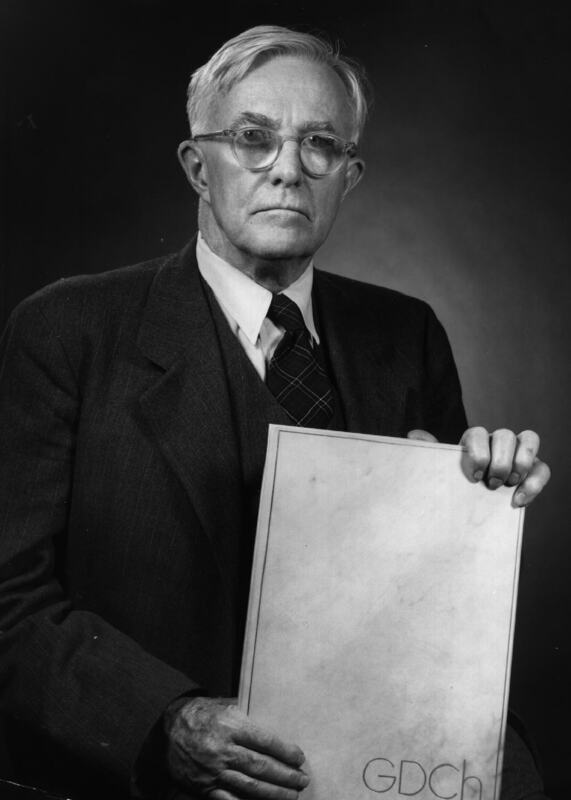 His study of thunderstorms with S. E. Reynolds and William Hume continued; this group pioneered in applying radar to study precipitation development and the electrification of thunderclouds. When cloud seeding was discovered in 1946 at General Electric Research Laboratory by Vincent Schaefer and Bernard Vonnegut, Dr. Langmuir, in whose laboratory Dr. Schaefer worked, made arrangements to carry out cloud seeding investigations with the New Mexico group. The three scientists thereafter were frequent research visitors in Socorro. A 10-km length of road from Water Canyon to the summit of the Magdalena Mountains was constructed by the Institute during 1962 and 1963. The main building on the mountain was completed in late 1963 with support from the National Science Foundation and from the Office of Naval Research. At that time the Laboratory was named for Irving Langmuir by its designer, Dr. Workman. The facilities were used immediately for an expanded thunderstorm program and, in 1964, a national lightning research effort began at Langmuir Laboratory in association with investigators from Los Alamos Scientific Laboratory (now Los Alamos National Laboratory), from industry, and from government agencies. In 1965, Dr. S. A. Colgate, another scientist, became president of the Institute and continued the development of the Laboratory. By this time, so many investigators were using the facilities that they had become crowded. Prof. C. B. Moore and R. L. Gibson, Institute Plant Superintendent, then constructed the Annex, a second laboratory building at the mountain top, with additional support from the National Science Foundation. The use of balloons by C. B. Moore to carry instruments into thunderclouds led to the erection of a balloon hangar on the open meadow 1 km northwest of the Laboratory in 1968. Dr. W. P. Winn introduced instrumented rockets in 1969 for measurements of electric fields in thunderclouds. He also developed new, balloon-borne electric field meters that have been widely used. As a result of these activities, free and captive balloons are now often used in studies of electric field charges carried by rain, electrical conductivity of the air, space charge, atmospheric radioactivity, cloud sizes and other measurements of thunderclouds. The increased balloon and rocket probing of thunderclouds prompted the establishment in 1970 of a small restricted airspace, R5113, by the Federal Aviation Administration and the Office of Naval Research. The airspace is about 8 km (5 miles) wide by 9 km (5.5 miles) long and extends from the surface to 14 km (45,000 ft) above sea level. Langmuir Laboratory personnel maintain control of the airspace during the summer on days when thunderstorms are likely. The high mountain site above the dusty, lower 30% of the Earth’s atmosphere provides excellent astronomical seeing most of the year. In the late 1960s, S. A. Colgate initiated astronomical research at the Laboratory and began constructing instruments for the study of supernovae. A comet observatory was constructed in 1973 by the Institute with support and instruments provided by the National Aeronautics and Space Administration. In the early stages of the Laboratory development, water for use by the people working there was obtained by the collection of rain that was stored in underground tanks. during the late 1960s the demands for water could not be met by this system, so S. A. Colgate and his associates constructed a dam in Sawmill Canyon and ran pipe and power lines between the dam and the Laboratory 610 m (2,000 ft) above the canyon floor. Water is now pumped to the Laboratory for use in the living quarters and for fire protection. Dr. K. W. Ford became president of the Institute in 1975. Under his administration, the atmospheric and astronomical research continued both at the Laboratory and at the Institute. Langmuir Laboratory is dedicated to serving visiting and resident scientists engaged in observational research. As such it consists of a unique complex of facilities from the two principal, multistoried structures on the mountain to computers, aircraft facilities, video cameras and other observational back-up tools located up to 38 km away. On top of the two principal buildings at the Laboratory are observatories for visual studies of nearby lightning and thunderclouds. The cupola on the main building was designed with plate-glass windows for lightning photography; the lookout on the annex building contains strip-chart recorders for electric field, space charge, rain current, and wind data for correlation with direct observations of thunderclouds and lightning. An automatic weather observer at the Laboratory records the cloud development and behavior with photo-electrically controlled, 16-mm time-lapse photographs of a convex parabolic mirror showing the entire sky overhead once every 20 seconds during the daylight hours. In addition to recording the view of the sky overhead, each photograph includes the view of a wind sock and of a data panel displaying the date, time, rain intensity, electric field strength, lightning occurrences and air temperature. Large amounts of information must be recorded and processed in order to describe the behavior of thunderstorms. Telemetered outputs of the 100 rain gauges, signals received by the 3-cm vertically-scanning cloud physics radars, and the 10-cm lightning detection radar, thunder arriving at special low-frequency microphones, electric field intensity measurements, wind measurements, and other data are recorded at the Laboratory in digital form on magnetic tape and then processed through a PDP-11/20 minicomputer located in Workman Center on the Institute campus. This computer facility, established in 1974 by Prof. C. R. Holmes, is used to produce cross-section maps of thunderstorms from radar data, rain intensity contours, maps showing lightning channels in thunderstorms, and the electrical charge centers in thunderclouds. A battery-powered, time-code generator synchronizes all of the thunderstorm observations at and around the Laboratory with IRIG B time signals linked to radio station WWV. A low-power radio transmitter at the Laboratory, radio station KA2 XEZ operating on 219 MHz, distributes time and lightning occurrence signals to the three camera stations photographing clouds over the Magdalena Mountains so that the cloud development can be coordinated with the events occurring beneath a thundercloud. One of the camera stations, near old Fort Craig of Civil War fame, is situated on Interstate 25 about 37 km south of the mountain top. A second station is located on the east side of Socorro and the third is 13 km west of the laboratory on Cat Mountain Ranch just south of U.S. Highway 60. Automated time-lapse cameras are located at each of these stations; they are activated each summer day at 0800 local time and take one electrically-controlled exposure every 20 seconds. The cameras operate 10 hours each day covering two days on a single roll of film. The mountain top is often inside the base of a thundercloud so that the growth of clouds overhead cannot be observed directly from the Laboratory. In order that balloons and rockets can be launched at the best times when cloud turrets develop over the mountains, two remote television systems operate on vacant channels in the commercial television bands with Federal Communications Commission approval: A television camera at Fort Craig sends the view of the clouds over the mountain to the Laboratory with a low-powered transmission on VHF channel 10 while the view as seen from 120 degrees to the west is sent from the Cat Mountain Ranch station on channel 11. The balloon hangar is 8 m by 8 m by 18 m long with large doors that completely open the north end for balloon entry and storage. A large helium trailer has been supplied by the Office of Naval Research for balloon inflation and two large mobile winches are in use for captive balloons flying at heights of up to 3 km above the 3.2 km altitude of the mountain. Radio direction finders, theodolites, and radars are used to track the free and captive balloons flown over the mountain in the research studies. SPTVAR (Special Purpose Test Vehicle for Atmospheric Research), a powered Schweizer airplane provided by the Office of naval Research in 1975, has been instrumented for atmospheric electrical and cloud physics measurements of the conditions in developing thunderclouds. Data gathered in flight is transmitted to a ground station for flight control and for the scientific studies. The turbo-charged aircraft flies at 40 m s m -1 (about 90 mph( and has a service ceiling of 12 km (39,000 ft.). It is used regularly to gather data from thunderclouds over the Laboratory and at the Kennedy Space Center in Florida during the Thunderstorm Research International Program and for the launches of space flights. As part of his research into atmospheric radioactivity, Prof. M. H. Wilkening has assembled the facilities necessary for sampling and for analyzing atmospheric radon and its daughter products. These facilities are used extensively in tracer studies of ion transport, of cumulus convection, and of mountain-valley circulations. A steel cable 12 mm (1/2 inch) in diameter crosses Sawmill Canyon with a single span of 2000 m (6,500 ft.). This cable was installed by S. A. Colgate and C. B. Moore with NSF support for lightning strike studies and for charge release experiments aimed at the artificial electrification of clouds. Ceramic and glass fiber insulators at the two supporting towers isolate the cable from Earth. A 150-kV power supply is attached to the cable for the charge release experiments and a 2-m spark gap is used for the lightning strike studies. A small photographic darkroom is available in the main laboratory. Other facilities to support research include a machine shop and a garage where repairs and equipment construction can be undertaken on the mountain top. Housing for about 20 people is available at the Laboratory as well as kitchen and dining facilities. Electrical power is provided by three 100-kW diesel powered generators and by a Socorro Electric Cooperative power line. Electricity is available at most sites along the mountain ridge. The Socorro Municipal Airport provides a convenient operations base for research flights over Langmuir Laboratory. It has a single paved runway 1780 m (5,840 ft.) long at an altitude of 1453 m (4,766 ft.) and is lighted at night. To house the SPTVAR airplane, a hangar was erected in 1976. light aircraft are available for rental, and on numerous occasions the airport has served as a base for Queenaire planes from the National Center for Atmospheric Research while they were being used in missions by Tech scientists. 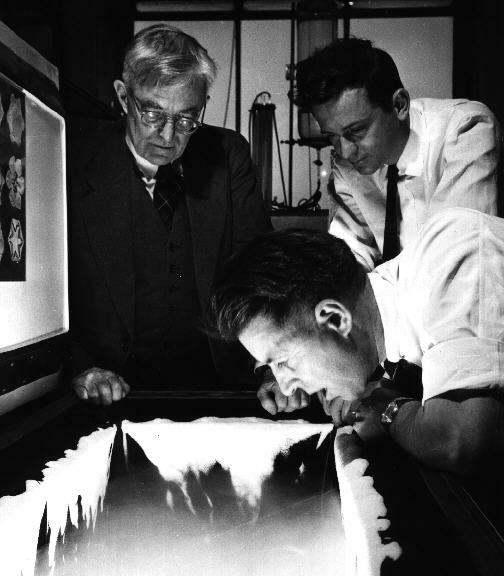 While much of the work at the Laboratory is directed toward the study of thunderclouds, lightning, and atmospheric electricity by Institute scientists, other investigators have undertaken a wide variety of research including investigations of cosmic rays, of ozone, and of the oxides of nitrogen. Far form atmospheric physics are the studies of bats, hummingbirds, butterflies and plant life carried out by visiting scientists. Since the remote location is free form man-made light contamination, it has been found to be excellent for astronomical and upper atmospheric observations. measurements of the night sky luminosities have been carried out at Langmuir Laboratory by Dr. Brian Tinsley of the University of Texas at Dallas. An automated, 75-cm (30-inch) telescope with digital output for the early detection and study of supernovae has been constructed by Stirling A. Colgate and Elliott Moore. The telescope and digital television detector are operated from the central computer of New Mexico Tech via a microwave link. The digital pictures of galaxies will be “recognized” by the computer and compared digitally to previous images of each galaxy. The system will be arranged to detect changes in brightness of each galaxy and thereby to provide early recognition of a new supernova which may be nearly as bright as the whole galaxy. The telescope will also have provisions for recording stellar spectra under remote control. In 1973, with the support and cooperation of the NASA-Goddard Space Flight Center, Dr. Elliott Moore and his associates constructed the Joint Observatory for Cometary Research (JOCR), the only facility dedicated to cometary research in this hemisphere. The twin domes contain a 35-cm (14-inch) aperture F/2 flat-field Schmidt camera and a 40-cm (16-inch) F/35 Cassegrain telescope. The Schmidt telescope is primarily used for direct photography of comet tails, in studies of the direction and magnitude of the solar wind in the inner solar system and of comet tail dynamics. For studies of the inner coma of a comet, the Cassegrain telescope is equipped with a “planetary” camera for wide-band or interference filter photography, a transmission grating for low dispersion spectrography, and an echelle spectrograph that uses an image tube. In addition, a portable 25-cm (10-inch) aperture Schmidt-Cassegrain equipped with a photoelectric photometer is used for interference filter measurements of the integrated luminosities of comets and of bright stars. A dual, parallel micro-computer system with a color graphics terminal, teletype, and magnetic tape storage is used for the reduction of data. In the observatory is a small darkroom for plate loading and test plate development without running water. A nitrogen burst, temperature controlled system for photographic plate processing is located on the Institute campus. A two-coordinate Mann measuring engine and a Joyce-Loebl isodensitometer for plate reduction are among the facilities of the observatory.